There aren't many games that can boast that they feature squid parasites. With a lot of videogames, what you see is what you get. That's kind of how it works in the Dreamcast game, Seaman. What you see is a fish with the face of a middle-aged man, and and what you get is insulted. In Issue 290 of The Escapist, Brendan Main takes a retrospective look at the most bizarre aquarium to ever grace a console. From the very start, Seaman differentiates itself from other pet simulations. You begin with a tank, mostly empty, inhabited by a solitary nautilus that swims aimlessly about. But this is not your pet - this is fish food. The eponymous "seamen" start as parasitic worms that burrow and incubate inside the hapless creature until they burst out as fresh-faced fishies. There is no explanation or introduction - just gastrointestinal infestation, and the slow death of a squid being gnawed from the inside out. This matter-of-fact explosion of aquatic life manages to elude the many niceties of pet ownership. It skips the trip to the pet shop to agonize over a kennel full of doe-eyed cuties. No picking and choosing, no watching them all run about, no promise that you and your new companion will be best buds forever. The standard pet-game values of friendship, codependence and responsibility are likewise nowhere to be found. In Seaman, there are no choices. Rather, "they" choose "you", at least as much as they chose that squid. You catch them like the clap. The creatures that emerge are not predisposed to giving you their unconditional love - rather, you'll be lucky if they don't hate your guts. It's a game that asks the player a lot of questions, although a lot of them are variations on, "what the heck is going on?" 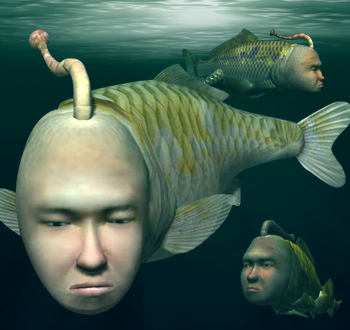 You can read more about the fabulous - if baffling - world of Seaman in Main's article, "Thanks For all the Fish."